A development report from Hines includes this rendering of what appears to be the new Apache Corporation headquarters planned for mixed-use BLVD Place just north of the Galleria. The report names the wafer-like building “Project Alpha” and describes it as 34 stories and 750,000-sq.-ft. of office space with a fitness center and cafeteria. Currently, Apache is headquartered at Post Oak Central. I Think it’s Elegant and Dignified. Houston is about the dollar above all else. If pretty’s going to cost them extra money, you ain’t gettin’ pretty. Last I heard was that Apache had not finalized the decision to build. They own the lot though so I imagine it will go up at some point. This is architecture, folks. Pure, no-nonsense, suit and tie modernism. Reminds me of the Seagram building. Well that’s boring as hell. Even the new tower in Midland is more interesting than that. Heck, the new Midland tower is more interesting than every new tower in H-Town! Why is every new design in Houston so plain and boring? I don’t get it. This city needs some major design overhaul. And here’s the Midland tower. Its pretty dull, but at least its simple and not a Frankenbuilding with 8 different wall treatments like BBVA Compass. As far as dull box buildings go, the new BHP building going in up the street is going to be a lot worse. Personally I think it looks very sharp and suits its tenant well. The lobby’s nice and bright; like the eave surrounding it. And I like the recessed sides—bam, you’ve expanded the number of “corner offices” instantly. It looks like something that would plug into a computer. Not good, not bad but it will eventually be appreciated for the era in which it was built eventually. The Midland tower will never get built. If you read the comments of Midlanders about the Midland Tower, you feel like deja vu all over again… Monstrosity, shades buildings next door, destroys trees, eats little children for breakfast etc. I do agree Houston needs some diversity in buildings – See NYC diversity in new construction… BUT I do like this. Very simple and crisp. Yeah, well, I think the Apache tower looks better, so there, prove me wrong. The Midland tower may never get built, but you have to admit the design is much more interesting than what we’ve seen in regards to anything in Houston. From the base to the tip, there’s much more to behold. I like the design. It looks like a well made/ taylored suit. Looks great, its always nice to see a new high-rise proposal. Cant wait to see it built. I like the design. Harkens back to 60s modern architecture. It’ll look great with all of the clean lines of BLVD Place. Of course, I also think the Humble Bldg downtown and the Wortham Tower on Allen Parkway are stunning as well. Wait, what are we taling about here? Yes, this building will win no prize. It’s elegant I suppose, in a staid dull sort of way–I was hoping it would be closer to the height of Marathon, but alas it won’t be as tall. I don’t understand why Houston can’t get more tapered Art Deco esque buildings like the beloved Transco–you ask any Houstonian their favorite skyscaper and 9 out of 10 will chose Transco–instead we get these dull blue glass boxes over and over again–and how in the world does a backwater like Midland get a proposed 58 story tower and Houston gets nothing above 50–tho really who thinks that Midland mess will get built–I mean, right? Wether it’s commercial buildings or our overdone mid rise apartment designs the curse of the “Box” strikes again! “Stop the Insanity” please. It’s obvious architects need go back to the drawing board, or their computers? Where is the creativity. How soon do you think the Downtown & Galleria skylines will merge? Another tower coming! It seems lately that the trend towards buildings in the US that are north of 50 floors is to have mixed uses like the Midland building. Chicago and New York have towers with maybe 20 floors of hotel space, then 30 or more floors of condos. The 80 story Aqua tower in Chicago, built a couple years ago, has a hotel, rental apartments, then condos closer toward the top. Houston’s development community hasn’t embraced this sort of building yet. But then, I’m not sure Houstonians have embraced high rise living either. To this day I do not understand the obsession about skyscraper heights. Do people actually measure a city’s worth/coolness by how tall the buildings are? Miami might be in the running. But I am not nerdy enough to check or care. Y’all are crazy. This building is like a 21st century adaptation of probably the most critically acclaimed skyscraper of the 20th century. It does more for our architectural landscape than some flamboyant, Dallas-like sky sculpture. Really? It’s not very high on my list. Not even in the top 3. 3. Wells Fargo Plaza: 80’s glam and decadence with a top hat shaped as $$$ and covered in a glass shade of US Currency GREEN. 2. J.P. Morgan Chase Tower designed by I.M. Pei… nuff said. 1. Let’s go back in time to 1975 when NYT’s architecture critic, Ada Louis Huxtable named Houston’s Pennzoil Place the BUILDING OF THE DECADE. This Philip Johnson designed skyscraper screams Gotham City and I still wonder if Bruce Wayne is hiding in there. It is hands down the most iconic building in the city. The only thing that is absurd is your rhetoric and broad, sweeping generalizations of what “Houston” favors. Yourself aside, for whom do you speak? Do you have a constituency? I said this was like a 21st century updating of the Seagram building. I invite anyone who disagrees to compare the pics. Not sure how Richard Meier got into this. 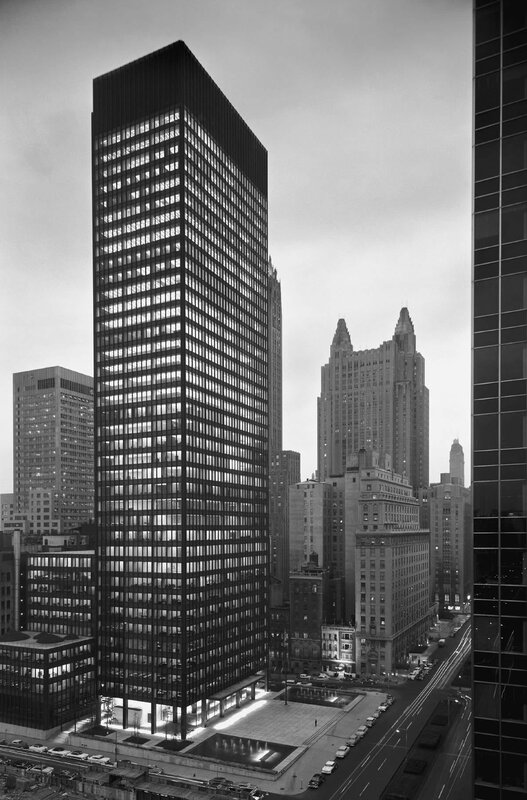 Explain to me how your criticism of this design as “plain and boring” wouldn’t be equally valid for the Seagram building. I don’t know what to say.